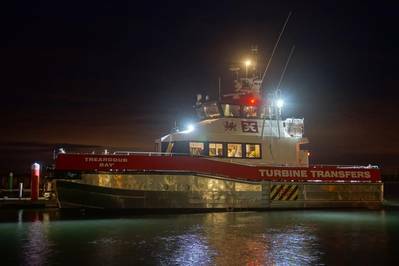 BMT Nigel Gee Ltd, a subsidiary of BMT Group Ltd, has announced that windfarm support vessel Trearddur Bay, its latest design for Turbine Transfers, has successfully completed sea trials in the Solent, achieving 31 knots with 8 metric tons DWT. With sea trials completed Trearddur Bay has immediately started work for Dong Energy. Built by Aluminium Marine Consultants (AMC) on the Isle of Wight, Trearddur Bay was launched in December 2014. The vessel is 21m long with a beam of 7.0m and utilises BMT’s well proven catamaran hull form. The design is already recognized for its excellent fuel economy and seakeeping. Trearddur Bay is reported to be the first vessel in world to be fitted with the Voith Linear Jet (VLJ); an innovative propulsor unit developed by Voith. The VLJ is an advanced ducted propeller combined with a stator positioned in the duct aft of the propeller, in a similar arrangement to that of a waterjet. Trearddur Bay is fitted with a VLJ 900 propelled by 2 x MTU 10V2000M72 engines offering very high efficiency and lower fuel consumption. For the same installed power the VLJ can provide a bollard pull approximately significantly higher than that of a waterjet and conventional fixed pitch propellers.